You can try this out as an alternative to surgeries or expensive laser treatments. At this price it is worth it to try this out first. It stimulates collagen and elastin production within your body. It even stimulates hair growth (for men?? This would be awesome.) It can be used anywhere on your body including your head! It works by creating multiple micro-channels in the skin, allowing your skin care products to penetrate deeper into the skin vs relying on your skin to absorb it at more than a superficial level. This description reminds me of aerating the lawn so that fertilizer can get down deeper inside. 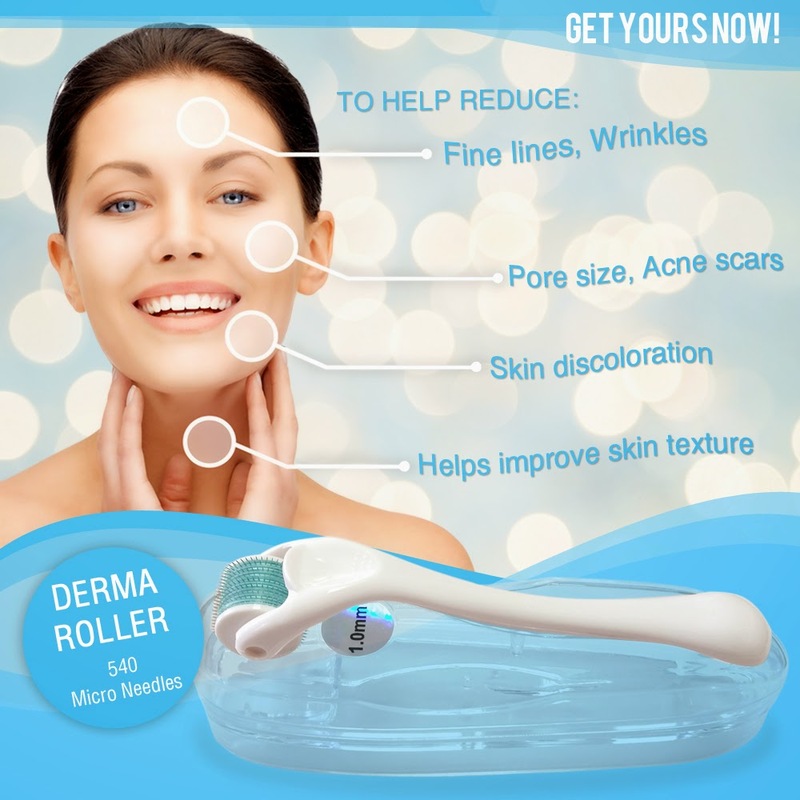 How do I use the derma roller? Make sure you wash the affected area of the skin first. Begin rolling over the area horizontally 4-5 times, and then start rolling vertically 4-5 times, and finish off with rolling diagonally 4-5 times over the affected area. Should I add pressure while I roll? No, added pressure will not accelerate results. Do not add pressure; just gently roll against the skin. You may however roll more times in a session to accelerate results. For example, instead of rolling 5 times over the affected area, you can roll 10 times. How often do I have to roll to see results? Rolling at night is recommended to avoid redness that may prevent you from doing normal activities. For the face roll 1-3 times a week, and for the body you may roll up to 2-4 times a week. Do I have to use a product after I roll? No, you do not have to use a product after you roll and your body will still naturally produce collagen. However, it is recommended that you do use a product, because after rolling the skin is readily able to absorb active ingredients. It is suggested you use a serum for the face, and cream for the body. Is it safe to use this everyday? It is safe, but it is not recommended. You should allow your body to slowly heal from the previous rolling session. Over stimulation will just end up with a much longer recovery. How do I clean the derma roller? Step 1: Pour rubbing alcohol to the roller storage container and submerge the roller. Let the roller and the container disinfect in the alcohol for 5 minutes.Step 2: Pour out the rubbing alcohol and run the container and roller under hot water. Step 3: Fill the sink with hot water, add a tablespoon of bleach, then place roller and container in. Leave for 5 minutes. Step 4: Take roller and container out and dry it off. Place roller back in container. Those are some of the frequently asked questions and hopefully it has helped you out. We will check in after a couple weeks to make sure you’re still loving your Derma Roller - and of course a few more tips.